Bethany Beach Vacation Rental – Haller, 18 Bayberry Road | Middlesex Beach Bethany Beach Rentals. Fabulous vintage contemporary from 60's; all-wood structure, with 3 bedrooms, 2 baths, best of both worlds: located in cozy, wooded Middlesex Beach community; and only 4 block walk to Atlantic Ocean and very private beach. Sleeps 8 to 9, has Great Room with cathedral ceiling and skylights and separate backroom with great views of treetops for winding down. Some amenities include: central AC, lengthy deck, full size washer/dryer, complete kitchen, ceiling fans in all rooms, 2 HDTVs, WiFi/internet, charcoal grill, smoker, oversized outdoor shower/changing stall. Non-smoking only, No pets allowed. Extremely inviting and relaxing. We love Middlesex Beach! This house is a charming, well-maintained three bedroom in The Pines. 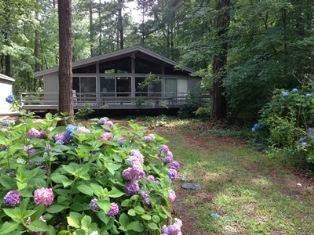 Much like it's neighbors, it's a 1960s era beach cottage on a private lot. It is a short walk to the beach. We were able to walk back and forth from the house to the beach, which made it quite convenient with children. It's a private beach, which is wonderful! Our experience renting through Long & Foster made everything quite easy. We called to have the cleaner come back to do the floors the day of our arrival, and everyone was prompt in their response. Wonderful customer service! We think this wonderful property could be improved with an outdoor clothesline in the back to hang wet towels and an outdoor table on the deck out front. This was our perfect vacation house. It had every convenience we needed for our stay and the short trip to a private beach made it even better. It was also a close drive to nearby towns for shopping and walking the boardwalk. We loved it and would definitely stay again.